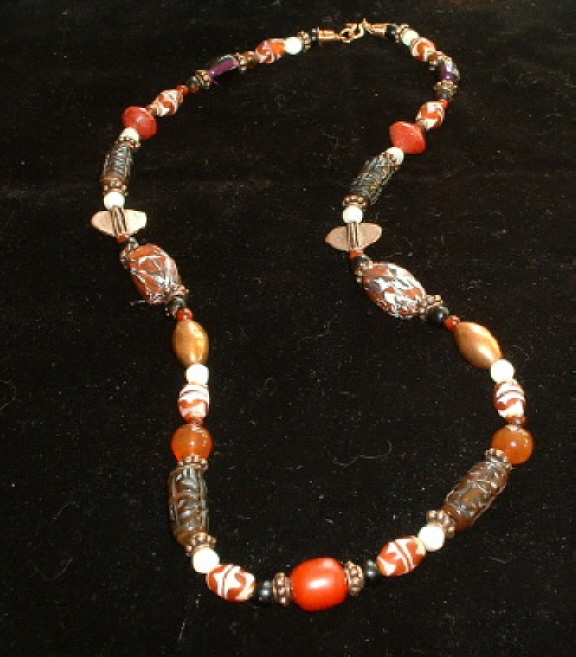 Shades of Autumn necklace with copper, Tibetan brown carved beads, orange, pearl - Bonnie Mincu design. Sophisticated necklace of Autumn tones combines Bonnie Mincu's custom polymer patterned beads with copper, Tibetan deep brown carved beads, mother-of-pearl beads, orange and white glass, black accents, carnelian and copper beads and custom copper clasp. Contact Bonnie Mincu about this jewelry.